Technology has fundamentally altered our lives and will continue to do so. Ethical considerations must remain guiding posts at all times. Undoubtedly, how we approach the regulation of emerging technologies will have wide implications for our definition of human dignity and the equality of individuals. 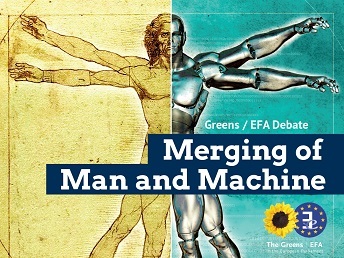 The Green Working Group Robotics – Jan Philipp Albrecht, Max Andersson, Julia Reda, Michel Reimon and Terry Reintke – would like to invite you to a public hearing on „Merging of man and machine: questions of ethics in dealing with emerging technology“. With this and further discussions we would like to develop a position on how society should respond to questions like How will our lives and our society change with the increasing fusion with modern technology? What role have politics and law in this context? Is there a need for regulation and if so, how? How can human rights be addressed? After short presentations by the speakers we have planned plenty of time for questions and answers. Please join us for the discussion! Enno Park, Chairman of Cyborgs e.V. See the bios of the speakers.